When I worked in the trading card industry in the ‘90s, the “hot term” during those collecting madness days was “chase card.” It was a marketing term to indicate the special cards, like a Michael Jordan gold plated, glossy chrome, limited edition, signed, with relic, alternate version, that people would chase to the ends of the earth knowing it would make them rich beyond their dreams. The key word to me was dreams. Because we had “chase cards” when I was growing up in the ‘50s, except we didn’t know the term, and we didn’t think about getting rich. The “chase cards” of that era were cards of your favorite team or favorite player, or in some cases, the missing numbers you sought to complete a set. Somehow, I don’t think I was the only kid in New York who felt this. To me, the ultimate chase card was Mickey Mantle. Except for his “All-Star cards” or cards on which he might be paired with someone else (like Willie Mays), or a team card in which his face was only 1/16”, there was one Mickey card each year, his regular Topps card – no frills, nothing different than anyone else, and no other manufacturer to compare it to. It really didn’t matter if we liked the picture or the design or not, it was the Mick! I promise you, I can still remember, all these later, where I stood when I opened a pack that had Mickey Mantle in it. On the sidewalk outside the playground in Queens. That moment of recognition when you smelled the gum, peeled back the wax, moved past Harry Chiti and Russ Kemmerer and Norm Larker, and there he was, like a movie star, the blonde hair, the handsome face, the bulging muscles, the uniform worn perfectly, the cap sitting just right, those pinstripes so vivid – wow. I even remember when one year his height went from 5’10” to six feet, and I kind of knew, even then, that he was probably still 5’10” but either the Yankees or Topps decided he was somehow more perfect as a six-footer. Stats? I know fans today love their stats to really know how a player does, but to me, the only real stats are the columns Topps gave us, the ones Sy Berger deemed necessary when he created the first set on his kitchen table in 1951. The relationship between boy and card was just as powerful as between boy and girl a few years later. But the cards came first. 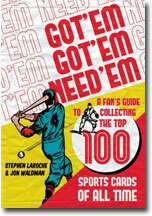 Jon Waldman and Stephen LaRoche have done us a service here by honing in on very special cards over the years. The exact one that clings to your memory (in my case, the ’56 Mantle), may not have made the list, but somehow, we “get it.” We know how it must have felt for seven-year old in 1933 to get a Babe Ruth, or for a six-year old in 1958 to get a Bobby Hull. My son got a Don Mattingly rookie card in 1984 and experienced the same thrill. The joy of fatherhood was never better captured than seeing history repeat. I once thought there was something very personal, very solitary about a boy and his collection. I didn’t think it was a very social activity. Then I found others who coveted the cards and we discovered trading and flipping, and suddenly, we were part of a social sub-culture. When we grew up we bonded anew with the phenomena of card shows. Here we were, all grown, able to confess that yes, when we see a sports obituary, the bubble gum card on which the fellow appeared is what we think of first. Thank you, Jon and Stephen for recognizing that. And you readers – it’s okay to have fun with this. I know I did.